In the 60th year of diplomatic relations between Germany and the State of Israel, the German Chamber Choir presents psalm settings of the 19th and 20th centuries from Christian and Jewish traditions and the area of tension between them. 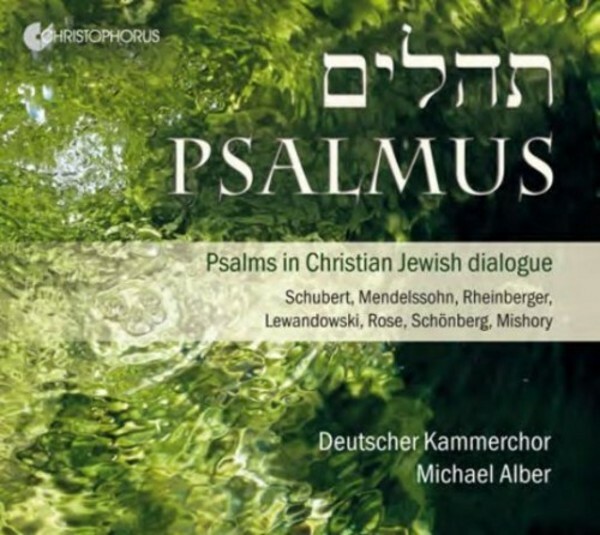 Psalms by Josef Rheinberger from Catholic Munich are contrasted with Hebrew and German settings by Louis Lewandowski and Alfred Rose. Between them stand Felix Mendelssohn, who originally hailed from a Jewish family but was baptised in the Protestant faith, and the Catholic Franz Schubert, who set a psalm in the Hebrew language for the Jewish synagogue in Vienna. Schoenberg's late confrontation with his Jewish faith and the founding of the State of Israel led to his setting of the 130th Psalm. Extremely fascinating, too, is the 'Water Psalm' by Gilead Mishory, a Jewish composer living in Germany, composed in response to a commission from the German Chamber Choir. The works on this CD were not composed out of the situation of Christians and Jews merely existing side by side, but reveal strong mutual cultural influences. The fact that the recording also meets the highest musical standards makes this CD a wonderful ambassador of Christian-Jewish cultural encounters.